We got up early enough to have a relaxing breakfast and enjoy the company of several of the other guests at the B&B. Unfortunately, our departure from the B&B was a little delayed which put pressure on us to get to the ferry terminal on time. We had a quick stop to make at the HSBC to open a US Dollar account on the way to the ferry. Our departure from HSBC would have given us plenty of time to get to the ferry if all the roads were open. We found ourselves being redirected on several occasions. At one point, Becky was wondering if we were totally lost! Fortunately, Scott saved the day and got us to the ferry terminal in time. In the end, we arrived at the ferry terminal only 30 minutes before the scheduled departure. With many of the other ferries, this would have been too late; fortunately, this was not the case with the Digby ferry. We rushed into the terminal to have no lines and the lady calmly processing the fee for our bikes and printing out our boarding passes. We were then shuffled directly onto the boat and had plenty of time to tie up our bikes and prepare for the voyage (about 3 hours). The stress of getting to the ferry on time took a lot out of Becky, so we decided that we would opt for a shorter ride and stay in Digby. There appeared to be a plethora of accommodations, so we could figure it out upon arrival. We rode off the ferry and continued along Ferry Road to Digby. The map of Digby provided by the tourism folks is clearly not to scale, as the ferry road is much longer than the town. We stopped at the Nova Scotia Visitor Info Centre, and they were very helpful (as is typically). We were pointed to a nice clean hotel in town offering $49 rooms. Given that camping would cost us $25 and Becky wasn’t feeling 100% yet, we opted for the comfy bed and room. We have been eating out or at other people’s homes since arriving in Saint John’s, Newfoundland (other than a couple of meals at the cottage in Shediac), so Becky was aching to cook. She did a quick side trip up to the Sobeys to buy veggies and we walked over to the fish market to buy some fresh Digby scallops. Becky cooked up a feast with our camp stove on the boardwalk behind the hotel, and we got to watch the sun set over the Bay of Fundy. 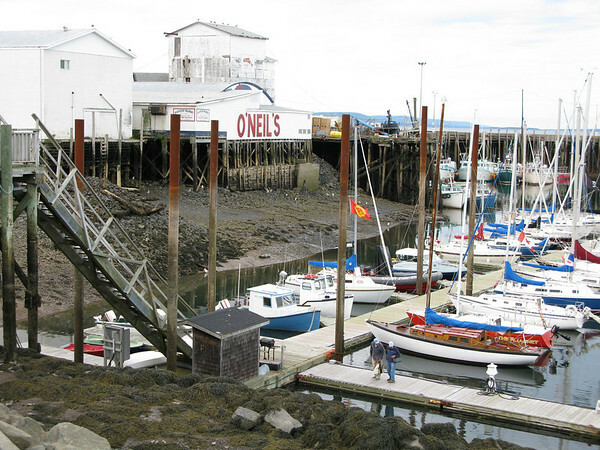 While eating dinner we observed the low tide, and the engineering required to maintain floating docks with a 15-foot tide. The combined staircase/gangway and the long posts for the docks to slide up and down as the tide changes. We also noticed a sunken boat at the end of the jetty. 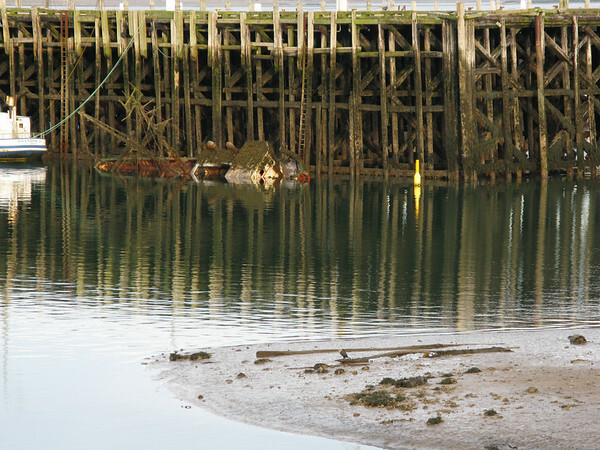 Good thing for the caution buoy, or someone could tie up to the wharf at high tide, and get a nasty surprise! This entry was posted on Tuesday, September 16th, 2008 at 2:16 pm	and is filed under Canada, Journal, Nova Scotia, Visited Places. You can follow any responses to this entry through the RSS 2.0 feed. You can leave a response, or trackback from your own site.